I do miss doing this on Saturday. Since I’ve gotten back into the swing of cooking for my family again, I’m finding a number of recipes I’ve been wanting to share. Whether it be in the kitchen, or in the church pew. Anyhoo. Needless to say, I was raised on a steady diet of fried everything, with a heavy helping of butter and a side of gravy. Oh, and a glass of tea so sweet your spoon would stand at attention. I’m considerably more health conscious now. And I’m always on the hunt for recipes that taste like comfort food, but without all the artery hardening capabilities. This week, I put together a little something by combining a few recipes. The result was fantastic. I want to say something about using corn flakes. I have gone the organic route when cooking with corn, because of how it has been seriously modified. It’s just a personal thing with me. I find organic corn flakes in Wal Mart, and they may only be about a $1 more than a regular brand. Also, you could run them through a processor, but I just throw them into a plastic ziploc and pound the heck out of them with the business end of my kitchen mallet. After I slice the chicken in half to make it thin, I go ahead and season it with salt, pepper, and garlic powder. I also added one of my favorite Weber seasonings, but you could add whatever you want at this point. There’s no measuring here. Just don’t overdo it. Then I dip the chicken into the yogurt, and then dredge it through the corn flakes. 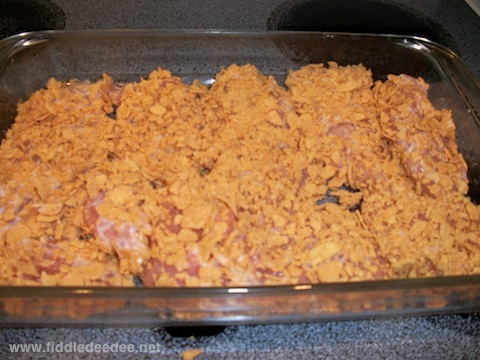 Place the coated chicken into a pre-greased (a shot of Pam would do it) 9 x 13 glass baking dish. After you’ve finished with all the chicken pieces, place the glass dish into a pre-heated 425 degree oven for 25 to 30 minutes. This week I served this with a side of whole grain rice and green beans. My nanny, who loved the lard very very much, would have been proud of me. Have a fantastic weekend, my friends! After a year of near total immobility, dinners at my house either came in a box, or from a drive-thru. I have finally gotten back into the swing of cooking for my family, and enjoying it. The meals are more or less planned in advance, thanks mostly to e-mealz (they are a beloved affiliate in my right sidebar) and a well stocked cookbook, filled with tried and true recipes that have not sent any members of my family to the hospital. And finally, the grocery shopping is back in my capable hands, a fact which no one is more thrilled about than Fiddledaddy. There are those nights when the best laid plans have fallen by the wayside. Enter a short cut that I found AT WAL-MART OF ALL PLACES. The other week when I was perusing the pasta aisle, I came across a box which caught my attention. And made me a little nostalgic. I saw a product with the name “Good Earth – Restaurant Favorites” on the top. Good Earth was a favorite restaurant of ours when we lived in Los Angeles. And I hadn’t seen one since moving to the far east (code for Florida). I picked up the flavor called “Herb Crusted Chicken” and thought I’d give it a shot. It was a bit of a gamble, since the price was $3.00 plus change. But all I needed to add was the chicken and a vegetable, since the whole grain pasta and all the sauces and seasonings were included. And I loved that the box boasted of No Artificial Flavors, Not Artificial Preservatives, and 100% Whole Grain Pasta. But they really had me at “enjoy in about 20 minutes or less”. After checking out the box, I found they have a website, and on the website, I was able to print out a $1.00 off coupon. This company also puts out products from Romano’s Macaroni Grill and Wanchai Ferry. Anyhoo, I wanted to pass on this tidbit for those times you’re in a hurry, and frozen pizza just won’t cut it. I was able to feed my little family of 5 for just under $10.00 (and that was because I was able to find organic chicken on sale). I’m kicking myself that I didn’t snap a picture before the whole thing was massacred on our kitchen table. Fiddledaddy was out of town all week on business. Which meant that I could get away with meals like Hot Dogs, Frozen Pizza, OH YES, YOU CAN EAT CEREAL FOR DINNER. It also meant that I didn’t have to fight over the remote with anyone once the children were mercifully asleep. A hollow victory, because I had to watch Lost all alone. And Lost, especially 3 hours of it, is likely to lead to restless sleep and nightmares about smoke monsters and VW buses. Thankfully, he returned bearing gifts. The children acquired some video games, but I am the one who SCORED. Fiddledaddy brought me a German Chocolate Cake. Because nothing says “I love you and I’m sorry that I left you all alone with our insane children” like a German Chocolate Cake. This is where I would like to tell you that I employed all of my will power and said “it’s the thought that counts” and fed the cake to my family. Thusly saving my fragile metabolism. But that would be a lie from the pit of hell. I scarfed that cake down before the dinner dishes were even cleared from the table. And yes, reluctantly, I shared with the children. But they did ask in unison, HEY, WHAT HAPPENED TO THE CHERRY ON TOP? Swedish Meatballs are a favorite with my children. I got this recipe from my e-mealz membership. I can’t say enough good things about e-mealz. They have saved me COUNTLESS hours and headaches by putting together meal plans and grocery lists for me. (The button is on my left sidebar, and pssst, if you order a membership using the coupon code “Dave”, you get a 3 month membership for $12.50, instead of $15.00.) This is an extremely easy recipe, and you can make extra and freeze some for later. * In lieu of bread crumbs, I use Rothbury Farms Seasoned Croutons. They are with whole wheat flour and THEY ARE TASTY. Gives the meatballs extra flavor. Just beat them into submission bread crumbs with a kitchen mallet. ** Please note: the recipe called for 2 t. salt. I tend to use less than what a recipe states, and I think 1 t. is perfect. *** Also, it’s hard to find envelopes of Dry Onion Soup Mix that do not contain MSG. I find them at the health food store. I’ll buy several at a time, and then just stick them in the freezer until I need them. Meatballs: Mix all meatball ingredients together. I wear those handy medical gloves so that I can use my hands WITHOUT EVER HAVING TO ACTUALLY TOUCH RAW MEAT. Form into 1″ meatballs. Place in a 13 x 9 glass baking dish. Bake @ 350 degrees for 30 minutes. Drain off any grease. Personally, I love the fact that these are made in the oven, and not in a skillet. But I reckon you could if you felt the urge. Gravy: In a large skillet, combine gravy ingredients. Stir well. Add cooked meatballs and simmer for 20 minutes. I love to serve this over whole wheat wide noodles with a side of green beans. Come to think of it, a slab of German Chocolate Cake might just complete this meal. Followed by a brisk 20 mile walk. I’m not a gourmet cook. And I don’t pretend to play one on my blog. Saturday Stirrings was born a couple of years ago out of a desire to share easy to fix meals that are easy on the budget and family friendly. I’m a decent cook. I didn’t start out that way. When I was first married, the only thing I knew how to cook involved a vat of bacon fat, flour, and a side of cream gravy that served the sole purpose of disguising whatever mystery meat I was serving. And then I married a man who had rather severe food sensitivities, and wasn’t really all that fond of anything battered and deep fried in bacon fat. I know. That should have been one of the questions asked during premarital counseling. And he certainly wished that “do you know what an iron is and how to use it?” would have been on his list of questions. So, maybe it was for the best. Little by little, I learned how to cook. And really, it wasn’t until I discovered a few really wonderful cookbooks, that I began preparing dishes that were actually edible. But I do not prefer to spend hours and hours slaving over the stove. I just want my family to think that I did. For the sympathy factor. So I’m always on the lookout for quick and easy recipes that will aid me in keeping my family alive. And fooled. Hence Saturday Stirrings. And whenever you all join in, that’s just the proverbial gravy on my chopped steak. Some of my favorite recipes have come from you all. I have typed them up, and even put your names on the page in my recipe book so that I can remember where they came from. I want to do something a wee bit different this week. In the form of some cooking questions, I want to pick your brains to find out more about your favorite places to find recipes. You can answer 1 or all of these questions in the comments section. I’ve listed my answers below the questions. 1. What is you favorite cookbook(s)? • “The SouthBeach Diet Cookbook” by Arthur Agatston, M.D. 2. What is your favorite cooking blog? 3. What is your favorite online recipe site? Bonus Question: Who is your favorite on-air cooking personality? After all these years, I’m still a cooking work in progress. But I’ve managed to NOT come within 10 feet of an iron. And THAT’S an accomplishment. Our homeschool group met on Friday at the playground. Jensen has two little buddies his age that he was hanging with. They are twin boys that belong to my sweet friend, Staci. Let’s take a moment of silence and hold Staci up in prayer. Because she has TWO 4 year old boys. In my book, that would be the equivalent of TWO Jensens. And incidentally, one of her boys is the same one that I inadvertently grabbed and hung onto by the scruff of the shirt, thinking he was mine on a field trip. While I continued the conversation I was having with another harried mom. When I eventually looked down and realized that he wasn’t Jensen I was horrified. So was he. But his mother has assured me that there were no lasting damaging side effects. This remains to be seen. Well, this particular boy and Jensen were knee deep in conversation, and we mothers were privy to what interests 4 year old boys because we were sitting just 2 feet away. The subject that they were enamored with was food. And I’d like to share the recipe that they concocted together. I took copious notes, in-between their thigh slapping and squeals of uproarious laughter. They went on to declare how GOOD their recipe would be! FLAMING POOP. What is it with boys? A joke just isn’t a good joke unless it contains poop. Hilarious. And just so we’re clear, Jensen often enters a room announcing in his best outside voice, “MOM! I HAD A GOOD SOLID POOP!” Always a proud parenting moment. Anyhoo. After the mothers were sufficiently grossed out, we shooed them off to play. Because if the truth be known, our Friday afternoon homeschool play group was not formed to aid in the socialization of our children. IT IS FOR THE WEARY PARENTS. So that we can have adult sized conversation, and assure one another that we’re not alone in our insanity. Mostly. What does this have to do with Saturday Stirrings? Nothing. Except that I’ve not been able to get Flaming Poop out of my head. And frankly, I don’t think I’ll be serving anything with whipped cream and marshmallows on top anytime soon. As always, if you have a recipe to share, please leave it in the comments. And if it’s on your blog, you can leave the URL to the post in the comments as well. But if the main ingredient is poop, then please refrain. Thank you, thank you for all your recipes last weekend when I was in dire need of cold weather comfort food. And thank you MelissaB. for your Taco Soup recipe in the comments section. I made it this week, the kids LOVED it, and I just 5 minutes ago enjoyed the leftovers. So, I’ll be working my way through those YUMMY recipes. This week I received my long awaited new and improved Vita-Mix Recipe Book. And I tried one of the recipes under the “breakfast” section and couldn’t wait to share it with you all. Preheat oven to 400 degrees. Spray a 9-inch pie plate with a shot of cooking spray. Blend on high for 30 seconds, or until well mixed. After my family devoured this dish, Fiddledaddy asked me if I had taken a picture of it. Ooops. It went awfully fast. A photograph of the empty dish would not have been as effective. So I did what any self respecting cook would do. I scanned the picture from the recipe book. Because IT REALLY DID LOOK LIKE THAT! Not even kidding. And I’m just guessing that those sticks in the middle of it are cinnamon sticks. I omitted those. 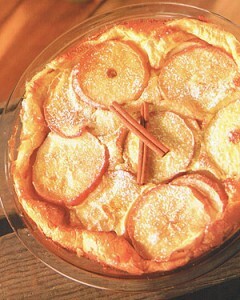 And while it made for a spectacular breakfast dish, I would totally make this for dessert. For company even. It was very simple, and extremely good. 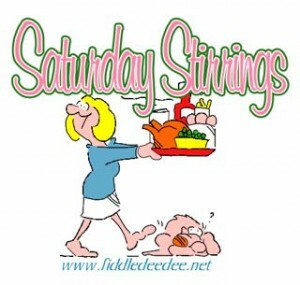 If you have a recipe to post for Saturday Stirrings, link up with Mr. Linky below. Be sure to link with you specific blog post URL. And then in your post, link back here to Saturday Stirrings, because that’s the polite thing to do. And don’t forget, the giveaway for the DVD Guitar Class ends Saturday night! Oh, and I’m going to leave the links open for my Twitter Party all weekend. Because THAT WAS FUN! Emme came screaming through the house tonight announcing that she heard on the radio we were suppose to have snow here in Equator, Florida. From the sound of her voice, I thought the house was ablaze. Which would be unusual since it could easily be snowing indoors. The intrepid Florida contractors and home builders do not take into account those rare winters when temperatures fall below 40 degrees. But I am not complaining. I love the colder weather. Makes me feel like we’re actually experiencing a season other than AFRICA HOT. And I also have a chance to wear my groovy fur boots out in public. The same boots that I’ve had to HIDE from my daughters. They did not inherit my petite feet, and at the ages of 8 and 10 have begun foraging through MY closet in search of cool shoes. One thing that I dearly love about cold weather is comfort food. No salads for me these last weeks. Nay. I’m craving hearty food that warms my innards and make me want to wear my stretchypants. My mother used to cook dishes like chicken and dumplings. A meal that warmed the house up with aromatic flavors, and put meat on your bones. Goodbye metabolism. Sadly, I have forgotten all of my cold weather cooking roots. Just yesterday, I stood outside shivering while attempting to grill chicken on my mini-Weber grill. So I was wondering if you all have any good and easy cold weather recipes you could share? You are welcome to leave your ideas in the comments, or link up with the URL of your specific post below in Mr. Linky. My mother had a rather southern tradition of always cooking black eyed peas, ham, and fried okra on New Years day. To my understanding, the black eyed peas were for luck. The fried okra was simply a homage to her love of bacon fat. I haven’t decided what New Years meal tradition to begin with my family yet. But after our recent stomach flu, I’m pretty sure that we’re not ready for bacon fat yet. However. When we were under siege, I spent a good deal of time scouring the internet for a potato soup recipe that didn’t include a bunch of contraband ingredients that would be contrary to a bland diet. I love making quick soup using my Vita-Mix, but I wanted something that would simmer on the stove and make the house smell nice. Because at that point, the house wasn’t smelling so nice. Just sayin’. I found the following recipe at Cooks.com and tweaked it just a little. It was a hit during our colonary affliction. And I loved it so much that I made up a batch just today. And the title of it is “Grandma’s Potato Soup.” I don’t know whose grandma, but somebodies. Sauté onions and celery in oil until soft. Add the water and bring to a boil. Then add the carrots, potatoes, and chicken bouillon. Add salt & pepper to taste. Reduce heat to a simmer, and let the whole thing cook for 1 hour. Towards the end of the cooking time, add some potato flakes to thicken the broth. I think I used the equivalent of 4 tablespoons. Tonight I served the soup with seasoned croutons and shredded mild cheddar cheese on top. Perfect for cooler weather. And yes, when Fiddledaddy was out slaving over the stricken mailbox, we were having a warm spell. Some of you living in the northern states noticed that. And I’m sure you’re not bitter. But now our weather has taken a turn for the colder. I couldn’t be happier. And btw, the brackets that Fiddledaddy used to fix the post worked beautifully. SO I WAS WRONG, HONEY. I CAN ADMIT THAT PUBLICLY. I’m not going to add Mr. Linky for this post, because I didn’t tell anyone I was actually going to post a Saturday Stirrings. I didn’t even know myself until I sat down to type.